Legal news for product liability attorneys – Fire hazard from Howard Berger indoor and outdoor extension cords and power strips prompts nationwide recall. Heavy duty outdoor and indoor household extension cords and power strips recalled. Washington, DC (www.NewYorkInjuryNews.com) – The U.S. Consumer Product Safety Commission, (CPSC) http://cpsc.gov, in cooperation with Howard Berger Co. Inc., of Cranbury, NJ, announced a voluntary recall March 31, 2010 of Indoor and Outdoor Extension Cords and Power Strips, as reported by the CPSC. 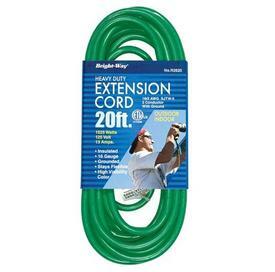 The recall involves Brightway indoor household extension cords and power strips and Brightway heavy duty outdoor extension cords. The cords and strips have inadequate coating material around the cords, and the copper conductors are smaller than required, posing a fire hazard to those using them. Model numbers range from R2600 through R2615 for the outdoor extension cords, EE6 through EE20 for the indoor extension cords and MP6DG for the power strips. The brand “Brightway” is printed on the cords and model numbers are printed on the packaging. About 12,000 products are being recalled. They were sold at hardware and discount stores nationwide from August 2009 until October 2009 and retailed between $1 and $20. The products were manufactured in China. According to the CPSC, consumers should stop using the extension cords and power strips immediately. The faulty products can be returned to the place of purchase for a full refund. All questions should be directed to Howard Berger at (800) 221-6895 between the hours of 8 a.m. and 5 p.m. PT Monday through Friday. Consumers can also visit the company website at www.hberger.com or email the firm at robertwinterstein@hberger.com.